The next two topics cover the larger questions of what to include in an investment portfolio, and what strategies achieve particular objectives. + What – to include in an investment portfolio, and how much should be invested in each asset, or asset class? The composition question. + When – to invest, when to buy, when to sell. The timing question. + Why? – invest now, why sell now? How is the investment strategy meeting the investment goals? The optimizing question. 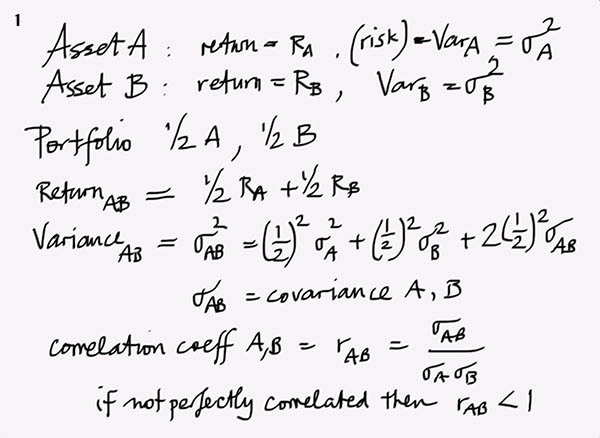 Although the mathematics is interesting the MAIN POINT is that the portfolio risk, as measured by the variance or standard deviation of the expected return to the portfolio, is less than the average risk of the two component assets (so long as the two assets do not have perfectly correlated returns.) If the portfolio consists of assets that move exactly with each other then adding more just leaves the investor exposed to the same amount of risk. But if an investor adds assets (eg more shares of different companies) that are in any way uncorrelated–even a little–then the portfolio risk is lower. If the returns are negatively correlated, the effect is much more pronounced! Many people, including investors, think that diversification is about adding more assets to the portfolio, but the number of assets (even different stocks) is not the important element. What adds diversification–and the resulting lowering of risks–is adding assets that are imperfectly correlated with each other. The reason why portfolio risk is reduced when there are large numbers of different assets in them is because there are very few asset returns that are perfectly correlated. But when an investor simply adds more assets (say stocks) to a portfolio, the reduced risk is more a function of luck than good choices! It is often asked “how many different stocks do I need in my portfolio to get the most benefit from diversification?” Is it 100, 50, 25, or just 10? The above suggests that the simple answer is that the number of different stocks is not important, but how the returns correlate with each other. It is quite possible to achieve a very high degree of diversification with just 10 stocks, or 5 stocks and an ETF! 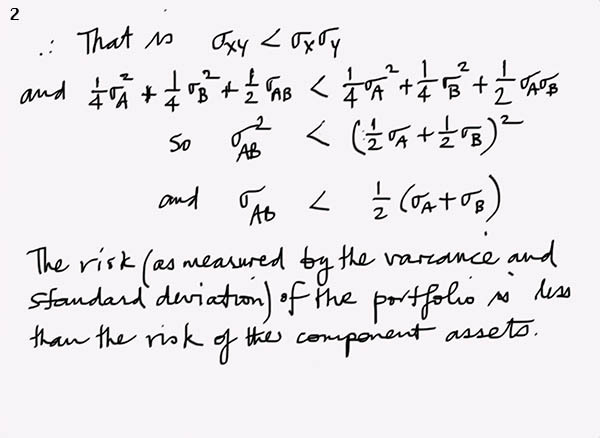 The mathematics of diversification also explains why the “market portfolio” in the Capital Asset Pricing Model is optimal. The market bundle, by definition, reflects the diversity of the market, and captures all imperfect correlations in the returns across all companies, industries and sectors. It also explains the attraction of Exchange Traded Funds (ETFs). About 80% of mutual funds under-perform the market (according to Motley Fool.) Not surprising if the market really is efficient, but depressing nonetheless. (ii) The investor enjoys the benefits of diversification through the holdings of the mutual fund. (iii) Benefit from active management by professional investors employed by the mutual funds. There are many mutual funds available–Fidelity alone offers over 10,000 different funds! Funds offer broad portfolios as well as those focussed on a geographical region, industry, sector or social philosophy (eg “green” investments.) Shares in mutual funds are purchased at the Net Asset Value (NAV) which is essentially the value of the portfolio less liabilities divided by the number of shares. This can change frequently and is generally not a good indicator of the value of the portfolio since the number of shares can change. The return on the portfolio over a period of time is the best indicator of mutual fund performance. Mutual funds charge fees, including management fees and trading fees (since the fund buys and sells instruments such as shares which incur fees.) While many funds are “no-load” funds, meaning they do not charge certain fees, all funds charge some fees. Actively managed funds tend to charge higher fees because of the salaries of managers and their support staff, as well as marketing and office expenses. Since funds provide investors with a service, it is reasonable for them to charge fees. Mutual funds are regulated, they must publish a prospectus to interested investors, and they must pay out capital gains to investors, which become taxable income. There are many criticisms of mutual funds, mainly focused on the fees, both directly and indirectly. The management and operational fees are pretty easy to understand, but there are also behaviors that increase costs and lower returns to investors. The main offender in this regard is churning, or turnover. Mutual funds must report what percentage of the fund holdings are traded each year. Low turnover reflects a buy-and-hold strategy whereas turnover ratios above 100% suggest managers are buying and selling frequently. Mutual funds are rated by companies such as Morningstar and Lipper. Many investors use these ratings of goals, service and performance to help choose mutual funds to invest their retirement savings, or inheritances. (1) Strategies – mutual funds tend (not all, or always) to take long positions on assets, whereas the “more aggressive” strategies of hedge funds include taking short positions and using derivatives. Short positions and options can be used to hedge (insure) against a downturn or bear (contractionary) market, while derivatives can take advantage of leverage. (2) Regulation – Mutual funds are regulated by the Securities and Exchange Commission (SEC), but hedge funds are not regulated by any US government agency. This has a large influence on how funds report activities to shareholders: mutual funds must report formally and regularly, hedge funds not so formally, not so regularly! Most hedge funds are set up as limited partnerships. Not everyone can invest in a hedge fund: usually people with over a million dollars in non-real estate wealth qualify, although there are other ways to qualify as an “accredited investor.” Hedge funds are usually limited to 100 investors. This explains in part why there are over 10,000 hedge funds. A common fee structure for hedge funds is the “2+20” which charges a flat 2% management fee on funds invested, and 20% of any return above an agreed-on benchmark return. Although competition for investors has put pressure on this “industry standard” it remains the benchmark for those wanting to invest in hedge funds. Some mutual funds exist to offer investors access to hedge funds at a lower price. These are so-called funds of funds. The portfolio of this kind of fund consists of hedge funds rather than the more standard equities, bonds, and real assets. They offer a considerable amount of diversification, but as pointed out above, whether this is optimal or not is an open question. Funds of funds may also incur higher fees due to having to pay the higher hedge fund fees as well as the standard mutual fund management fees. ETFs have become very popular and there is an estimated $1trillion invested in them. They offer risk reduction through diversity. They offer low transaction fees and almost negligible management fees. Choose an investment goal (eg retirement, 3-month trip to Europe, college education for your child) and briefly describe what portfolio you would recommend to achieve that goal. ETFs are like mutual funds–being portfolios of financial assets that track particular targets. Do you think they are more attractive than mutual funds, and why?